"Fantastic. It exceeded any expectations we had"
"We had a fabulous holiday, thanks so much for organising it for us!" "We had a fabulous time and will take many amazing memories from it - from the people, to the landscapes, to the food and to the spectacular animals we were lucky enough to observe. Thank you Tribes and Chris, in particular!" "Way surpassed everything we hoped for. Namibia was truly beautiful, all the accommodation was excellent (bar one stop, see later), we were looked after like royalty and the logistics worked perfectly. The wildlife was absolutely wonderful!! " "Fantastic holiday, just what we wanted." 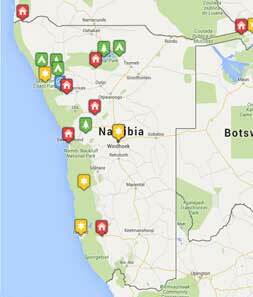 Start planning your tailor-made holiday to Namibia. Tell us what you want, and we will tailor make your perfect trip.  Flight time: Flights from UK to Windhoek are usually via Johannesburg or Frankfurt and take about 12.5 hours. Windhoek International Airport is 60km from the city centre.  Language: Namibiaâ€™s official language is English. Afrikaans, Dama/Nama, German, Herero, Oshiwambo, Sukwangali, Setswana and Silozi are also recognised.  Visas: Visas are not required British citizens for stays of up to 90 days.  Health: Malaria is present in Namibia. Certain areas are more high risk. A yellow fever vaccination is required for travellers arriving from countries with risk of yellow fever transmission; this includes transiting through a yellow fever risk country; make sure you have a valid yellow fever certificate with you.